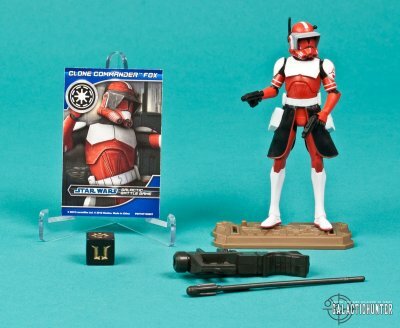 SCULPT/PAINT: Commander Fox in his Phase I armor was released as a Target exclusive in 2008 that quickly sold out. His Phase II armor has a lot more (Target) red with white accents and the Coruscant Guard symbol is now more discretely placed on his left shoulder plate rather than on his chest, which I prefer. The non-removable helmet features the distinct visor that's also seen on Commander Cody and the torso is re-purposed from the 2012 CW02 Clone Trooper. 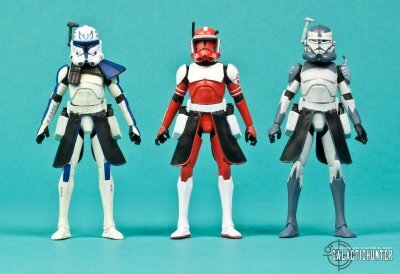 Fox also shares the same molded kama, functional holsters, and (sadly) lower legs of the new Captain Rex and Commander Wolffe. There are nice deco elements on his helmet and additional painted details on the back of his armor, which retains the insertion to plug in the CW2 Clone's rocket pack. Two white horizontal lines on his upper arms have an underlying nod to the Senate Guard's inevitable Shock Trooping. 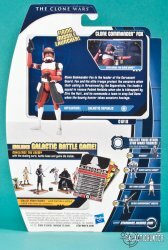 Hasbro appears to have missed deco on the lower front portion of the helmet that's clearly seen on the character photo as well as the figure image on the cardback. We may expect a running change in the future to correct this. From an aesthetic standpoint, Commander Fox looks much better proportioned than his 2008 version, which featured ball hinged knee and ankle articulation as well as better poseability. But that Target exclusive figure was mostly recycled parts with a higher pricepoint of $12.99 and a clamshell case. I prefer the new look, deco, and lower price of Phase II Fox, and while he could be superbly displayed loose or carded, you unfortunately won't get much action posing out of him. ARTICULATION: Is less more? With only 8 points of articulation, not really. For Clone Troopers, especially one as stunningly designed as Fox, you demand some lower leg articulation. Even adding ball hinged knees would've have improved this figure exponentially. 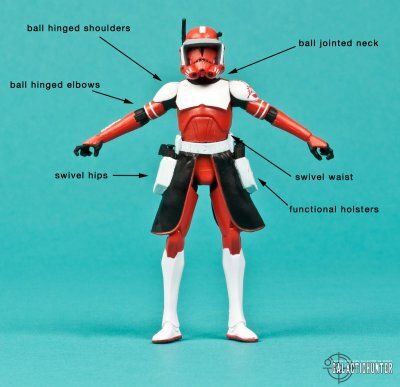 You could achieve different looks with ball hinged arms and a ball jointed neck that may be enough for some, and if Hasbro's market research is accurate, that "some" would mostly include kids. As it stands, and with no pun intended, Commander Fox can only be positioned upright with legs straight. That just doesn't cut it in 2012 for this collector, especially for 9-10 bucks of plastic. 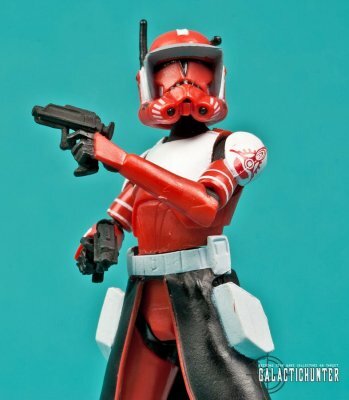 ACCESSORIES: Commander Fox is armed with his standard DC-17 Hand Blasters that fit snugly on the functional holsters. There's also the firing shoulder missile launcher that was also included with Oddball, the AT-TE Gunners and a few others. Don't poke your eye out, kids. 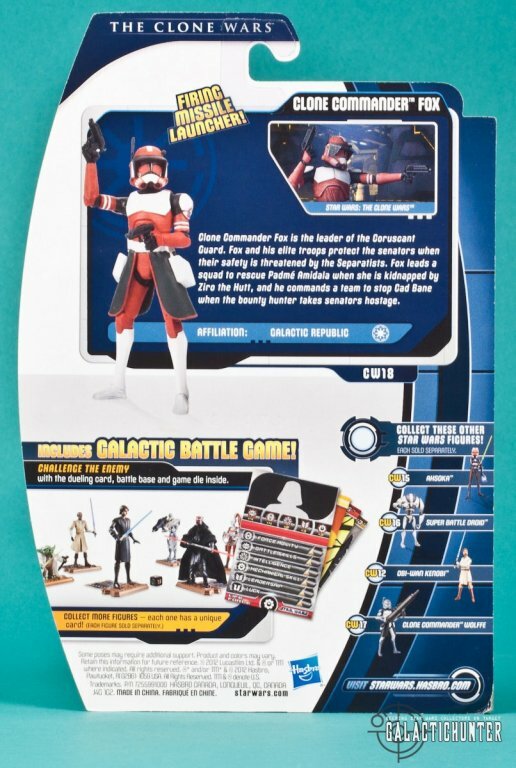 Components for the Galactic Battle Game are packed in with each 2012 Clone Wars figure that include a tan Star Wars action figure stand with an insertion for the character card on the back. There are also two notches on the rear of the stand to reveal and generate a "power boost". The character card and six sided game die feature all the icons for the character's "life force" or hit points. Commander Fox is particularly strong with Battle Skills (12 points), Leadership (11 points), and Inventory Control. I kid on the last one, of course. 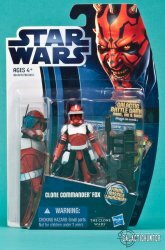 CARDBACK: It's the Movie Heroes/Clone Wars/Discover The Force unified cardback. The Maul graphic that graces the front is the theme for 2012's Phantom Menace 3D release. A character and figure photo along with bio and affiliation data are featured on the back of the card as well as images of other figures in the assortment. You'll also notice the variation with the helmet deco on the figure photo featured on the cardback which Hasbro may (or may not) eventually correct and run change. 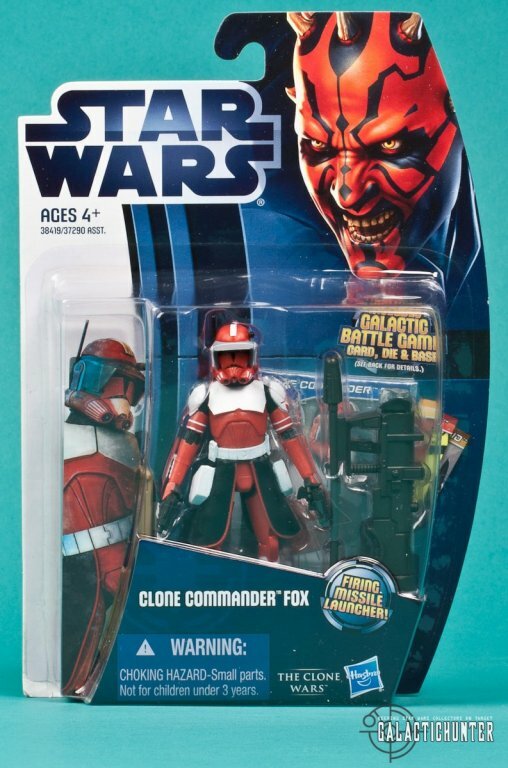 TOPPING THINGS OFF: Commander Fox is another nicely designed and aesthetically pleasing Clone warrior to join the ranks of the other Phase II Commanders released in 2012. 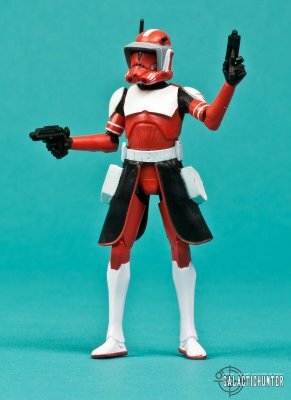 Whether intentional or not, he has Target DNA for his color scheme and looks awesome on display with nice painted details, although there looks to be missing deco on his helmet. Unfortunately, his poseability is limited due to a lack of knee and ankle articulation that doesn't translate too well for a character meant for dynamic display. Still, make no mistake, he'll be popular on the pegs along with the other Clone Commanders with 8 articulation points. The most recent case assortment shows him being allocated 2 per case, and there will be a few collectors who will easily buy and keep 2 of of this figure. The Fox chase will definitely be a bit of a challenge from the onset.